The condition is common and affects around 10% of the population, with severe cases having a significantly detrimental impact on quality of life. The pathophysiology of tinnitus is not well understood. Current theories suggest it comes from abnormal neuronal activity along the auditory pathway, originating anywhere along the auditory pathway. On examination, otoscopy and audiometry are essential. Examine the cranial nerves and TMJ routinely for focal neurology. All patients presenting with tinnitus, particularly those with symptoms persisting for greater than six months, should be referred for comprehensive audiological assessment. Such assessments include pure-tone audiometry (PTA) and tympanometry; patients’ blood pressure should be recorded as well. Most cases should have non-urgent blood tests sent, including full blood count, thyroid function tests (TFTs), lipid levels, and/or blood glucose (random or fasting). Routine imaging of the head and neck is not recommended. However, if there is persistent unilateral pulsatile tinnitus CT imaging with contrast will be indicated. MRI imaging of the internal acoustic meatus will be considered for persistent unilateral tinnitus especially if associated with unilateral sensorineural hearing loss. For the vast majority of affected, conservative management and reassurance is all that is required. Tinnitus is usually mild and will self-resolve over time. If an underlying cause is identified, this should be managed accordingly. For primary case, the focus of management is mainly centred on habituation to the symptoms*. Tinnitus retraining therapy (TRT) and cognitive behavioural therapy (CBT) have both also been shown to be effective at reducing the impact of tinnitus. As tinnitus is often accentuated in quiet environments, patients with concurrent hearing loss have been shown to benefit from the use of hearing aids. In some cases, tinnitus-masking devices are available which emit a constant, low-level white noise which help to distract patients. There is a limited role for surgery in the treatment of tinnitus. Acoustic neuromas, also termed vestibular schwannomas, are benign tumours that arise from the Schwann cells surrounding the vestibulocochlear nerve (CN VIII). 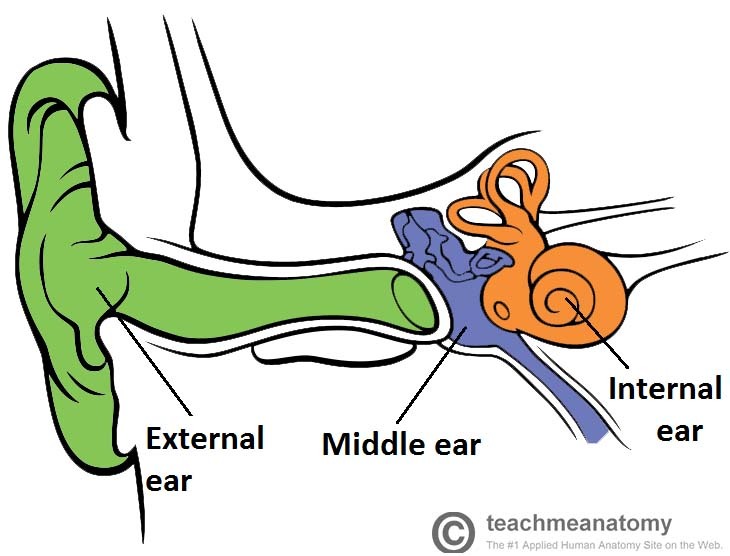 The classic triad is that of progressive unilateral sensorineural hearing loss, tinnitus, and vertigo, however patients commonly present with only one or two of these symptoms*. An MRI head with contrast (Fig. 3) is the gold standard for imaging suspected vestibular schwannomas*. 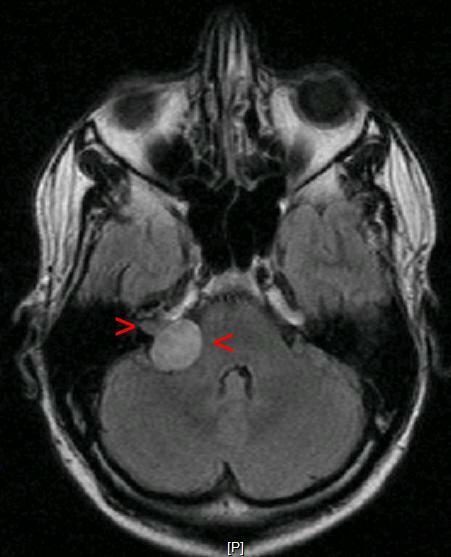 Acoustic neuromas are typically slow growing (2-3mm per year), therefore monitoring interval MRI scanning can be done for patients with small tumours, limited clinical signs, or in patients with significant co-morbidities. Stereotactic radiosurgery involves focal collimation of gamma rays to slow or stop tumour growth. This method tends to produce good tumour control, with high rates of hearing and facial nerve preservation. Surgical technique includes translabyrinthine, middle fossa, or retrosigmoid approaches, with the aim of surgery being for total removal of the tumour. Subtotal resection is often accepted where complete removal would lead to facial nerve compromise (and any remaining bulk managed with interval MRI scanning or radiosurgery if indicated). Surgical management for acoustic neuroma is often reserved for large tumours due to potential complications from surgery and management is based on the recommendation of the skull base MDT. Which of the following medication is associated with causing tinnitus? Which of the following is not a red flag for urgent referral for tinnitus?